You are currently browsing post Chocolate & Cinema SCPLF Fundraiser Coming to the Rialto in August . 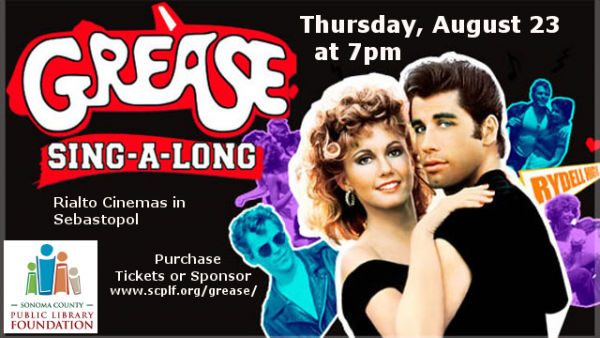 While not based on a book, Grease is a great choice for a fun night out! Please join us at the Rialto Cinemas in downtown Sebastopol for an evening of popcorn, singing, and a bag of fine local chocolate to take home. Singing is optional, but in a darkened theater, who’s gonna know it was you? This fundraiser supports the efforts of the Free Bookmobile’s parent organization, the Sonoma County Public Library Foundation (SCPLF). Founded in 1986, SCPLF aims for strengthening and promoting use of library resources, enthusiasm for reading, and increased literacy for all Sonoma County residents. The Foundation has over the years offered services such as free books for all local newborns, support for the Adult Literacy and Summer Reading programs, and collaboration on the establishment of new library branches in low-income areas. Tickets are just $20 in advance or $25 per person at the door. Just click here to go to the official “Buy Now” page and reserve your spot. Oh and spread the word…the Free Bookmobile will also be there to do what we do best…offer you terrific books!